For years people have been turning the ST-1’s MIX knob down all the way, opening the pedal, and turning up its internal volume control to maximum, and using the Supa-Trem as a very subtle clean boost. Now I’ve put a low-profile VOLUME knob on the outside of the pedal, and increased its available gain to around 15dB... allowing the ST-1 to pull double duty as a stellar clean boost. 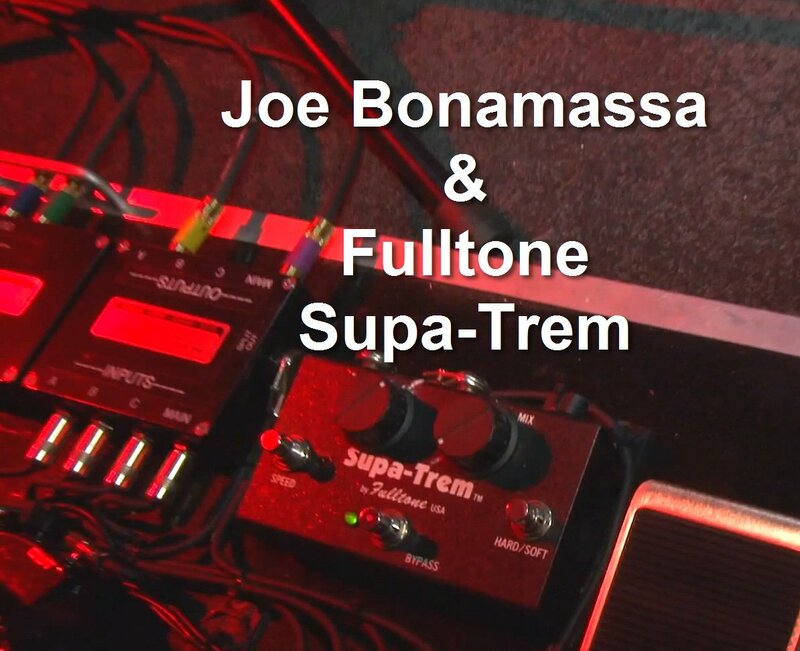 One reason the Supa-Trem sounds so good is that it uses a wonderful Analog Devices JFET AD711JN at the heart of its circuit, giving you a warm yet clear tone when your pedal is turned on. 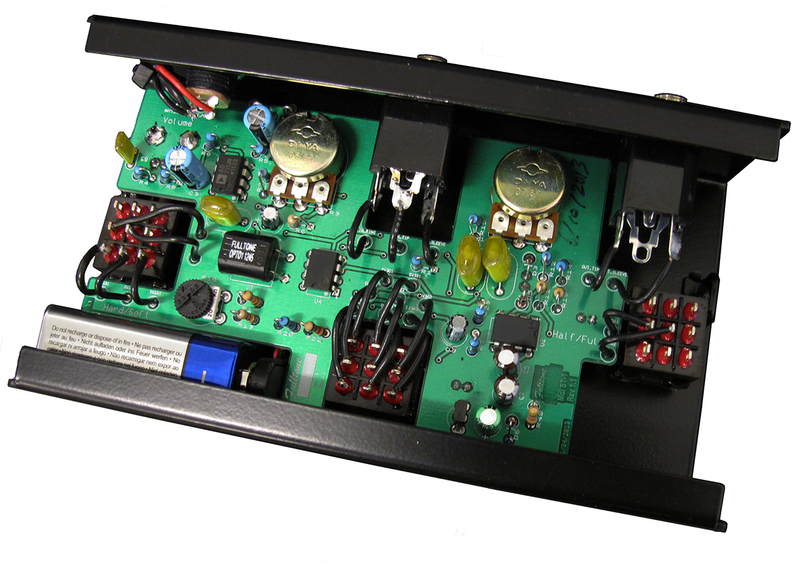 The ST-1 also employs a custom-designed Fulltone Opto-1 photocell with an extremely fast recovery time which no other manufacturer can match. This makes it behave just like an old 1960’s American tube-amp, but without the annoying ticking sounds that plague amps and other tremolo pedals. 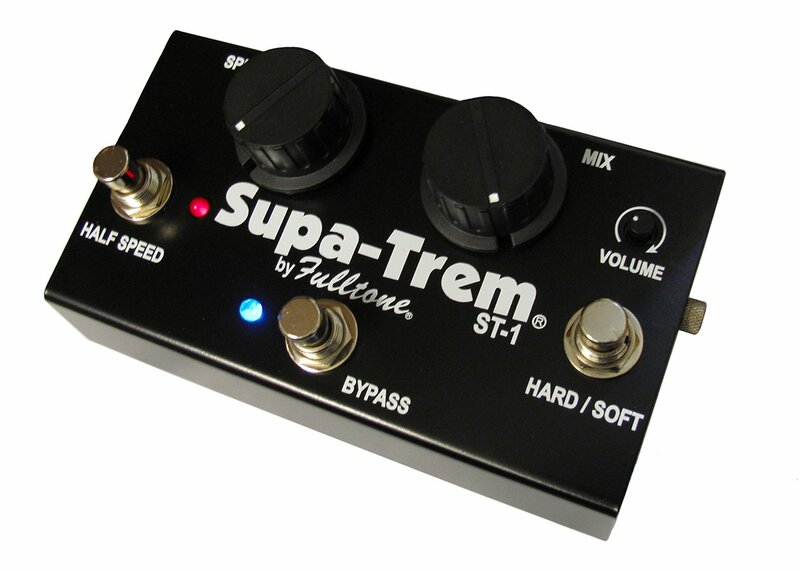 The Supa-Trem is the most versatile tremolo on the market, sporting True-Bypass with Blue ON/OFF L.E.D. and a Red RATE L.E.D. showing your speed at all times (even when pedal is OFF) so you can drop right into the song at the correct tempo. With the ST-1’s large RATE and MIX knobs you can fine-tune on-the-fly with your foot. The SPEED footswitch correctly halves or doubles your tempo so you stay rhythmically-correct with the tempo of the song you’re playing! Finally, there’s a HARD/SOFT footswitch for choosing between SOFT MODE (a rollicking sine-wave) or HARD MODE, which is more of a square-wave machine-gun stutter. There's an internal trimmer to fine-tune the current reaching the Photocell to change feel of the waveform, although we recommend leaving it where we set it so you have the ability to turn down the MIX control and not hear any tremolo when using as a clean boost. Cool Trick! Turn the MIX knob full CCW, make sure the HARD/SOFT switch is set to SOFT, and your pedal becomes an amazing Clean Boost device when you turn it on... simply set the VOLUME knob to how ever much kick you want. NOW, if you want to add tremolo, simply step on the HARD/SOFT footswitch and you’ll have a normal sounding sine-wave tremolo.